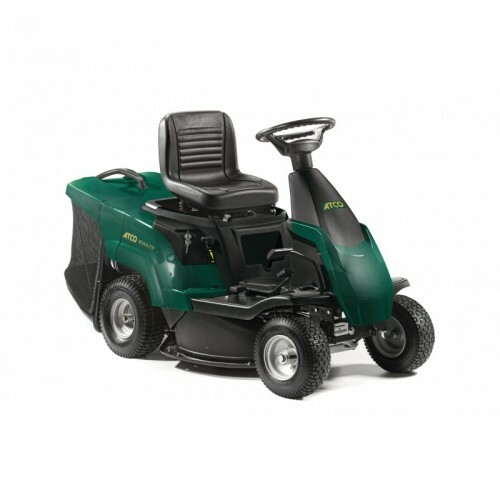 A compact lawn rider, the Rider 27H is suitable for gardens up to 0.75 acres. With a Briggs & Stratton 950 Series ES engine and hydrostatic transmission, it has a 66cm working width and 6 cutting heights from 30mm to 76mm. The 150 litre capacity grass collector can be emptied from the driving seat. Optional accessories include a mulching kit. Easy and fun to use, the Rider 27H is an ideal ride-on mower for smaller areas. It is powered by a 223cc Briggs & Stratton 950 Series ES electric key start engine and has a hydrostatic transmission, so it is as easy to drive as an automatic car. Simply press the front of the pedal to move forward; the more pressure you apply the faster your speed. To reverse, press the rear section of the pedal. You have ultimate control even when manoeuvring in and out of tight spots. Covered by a 2 year manufacturer's warranty, the Rider 27H is suitable for smaller gardens up to 0.75 acres.